Housed in BOSS' popular twin-pedal chassis, the RC-30's new features include true stereo ins/outs and up to three hours of onboard stereo recording and loop storage. The new dual-phrase loop feature lets you create and play two completely independent stereo loops in perfect sync. LOOP FX is for processing your loops in real time, with 99 memory slots for storage. 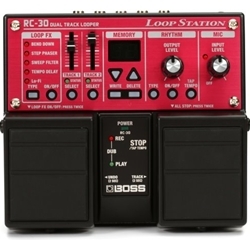 The RC-30 also boasts a USB 2.0 port for swapping and managing WAV loops with your computer. A mic input with phantom power, aux in jack for portable devices, and a key selection of onboard rhythms including real audio drum loops come standard.